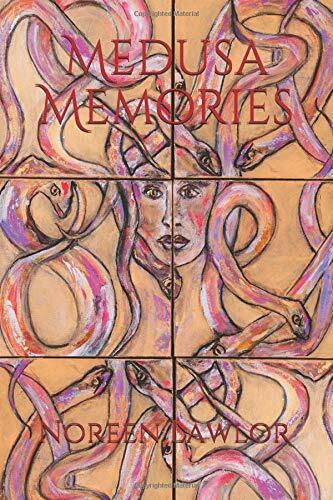 Cholla Needles Arts & Literary Library: Noreen Lawlor - Medusa Memories - New Book! Noreen Lawlor is a poet and artist as well as a therapist. This book combines her art and poetry. She lived in Ojai for fifteen years and currently resides in Joshua Tree. Her four previous books are Matilija Days, Sacred Possibilities, Tangled Limbs and Prayers, and Mostly Mojave. now slithers, writhes and coils everywhere. which slithers writhes and coils everywhere. drape tentacles into old dreams that fade. is now a wriggling mass of my despair. then slithers writhes and coils everywhere. in ears and eyes and cheeks where bade.